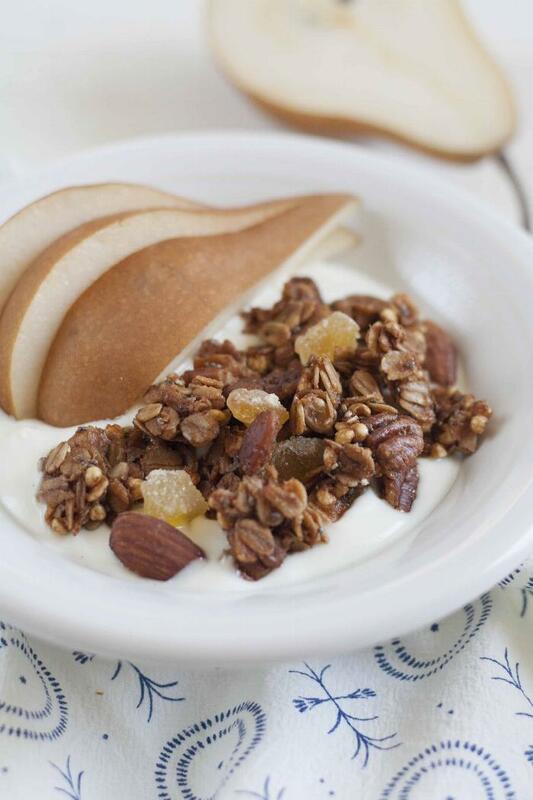 This easy, no stir granola is perfectly crunchy and laced with the sweet heat of ginger. 1Preheat oven with rack positioned in the center to 300 degrees. Line two large rimmed baking sheets with parchment paper and set aside. 2In a large bowl mix together the oats, puffed millet, almonds, pecans, sunflower seeds, chia seeds, ground ginger, cinnamon, allspice, and cloves. 3In a small saucepan over medium heat, melt the butter along with the maple syrup and salt. Bring to a simmer and allow to simmer for one minute, then remove from heat and stir in the vanilla extract. 4Pour the butter mixture over the oat mixture and stir well to combine. 5Scrape the entire bowl of granola onto one of the lined baking sheets and spread evenly across the pan. Then, take the second sheet of parchment paper and lay on top of the sticky granola mixture. Next, place the second baking sheet on top of the parchment paper to sandwich the granola. 6Bake the granola in the preheated oven for about 35 minutes or until the mixture is golden brown. 7Remove the granola, turn off the oven, and allow the oven to cool slightly. Meanwhile, take off the top baking sheet and on top of the second piece of parchment paper, sprinkle the chopped crystallized ginger. Return the granola (now with ginger) to the turned off oven to dry out for a few more hours up to overnight. 8Store granola in an airtight container at room temp for several weeks. *You can substitute the puffed millet with any whole grain puffed cereal, or more oats. **Instead of coconut sugar, you can use any unrefined sugar such as muscobado, brown sugar, or coconut palm sugar.